CO-NAME would like to say many thanks to all who contributed to the success of the First Statewide Conference on April 10, 2008. If you have any photos from the conference that would like to share, please submit them to martin@reinhardtassociates.net. The Colorado Association of Multicultural Educators started out in the mid-1990's as an informal monthly meeting of school district multicultural coordinators, those who had the responsibility without the title, CDE officials involved with diversity issues, organizations involved in equity and independent diversity consultants. These individuals met to plan how to improve the multicultural climate of schools, to educate each other and to provide support in pursuit of this important mission. Since that time, we have gained membership from across the state of Colorado and have continued moving towards our goals. In Spring 2006, we became the ratified Colorado Chapter of the National Assocation for Multicultural Education (CO-NAME). CO-NAME will positively impact educational equity for all students in Colorado. CO-NAME will encourage an awareness of diversity and equity issues as it relates to student achievement. 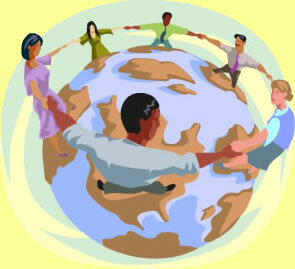 CO-NAME will establish ongoing dialogue that recognizes, supports, and respects human diversity. CO-NAME will assist educational institutions in promoting multicultural education as an integral part of the educational process. CO-NAME will provide support to build the will, skill, knowledge, and capacity to challenge the inequities in public educational systems. WE are consciously and proactively committed to promoting school cultures that demonstrate equity and high expectations in practice and people. WE believe that diversity includes, but not limited to, race, ethnicity, color, national origin, ancestry, gender, sexual orientation, religion, age, socioeconomic status, family structure, language, disability, and immigration status. WE believe that people's beliefs, prejudices, values, and biases must be meaningfully addressed in order to eliminate individual and institutional practices and policies that hinder student's ability to learn. WE believe that educators and communities have a critical role in eradicating the inequities and prejudices that hinder students' ability to learn.